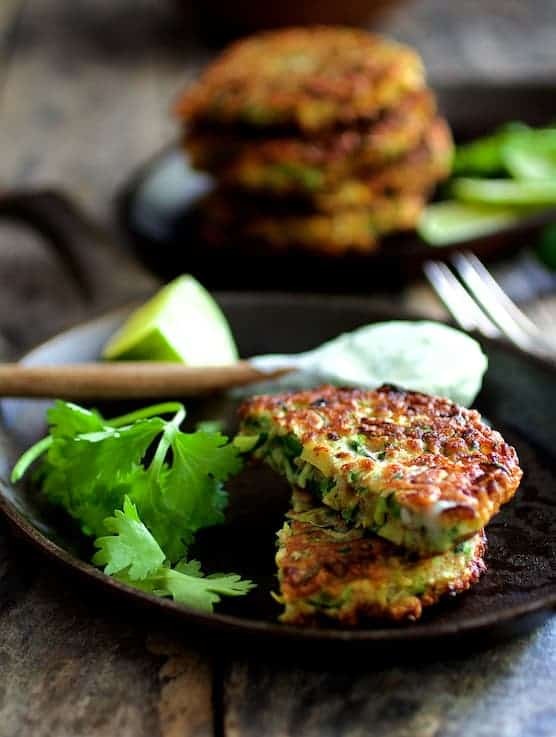 Whole Grain Zucchini Jalapeno Fritters are the traditional zucchini fritter reinvented with better-for-you whole-grain flour, some kick with fresh jalapeno and zippy cilantro sour cream on the side! It was just one of those weeks! Oh, nothing tragic–thankfully–but it was just one of those weeks where, through a series of mishaps, the universe was trying to tell me something. …And one of the messages I got this week was to be more grateful. It’s amazing how your outlook and attitude transforms when you adopt gratitude as an attitude! So, from the bottom of my heart, I am very grateful that you’re here, reading this and that you bothered to check out From A Chef’s Kitchen. I’ve been blogging for a little over two years. As you may recall, I changed my blog name (also known as rebranding) last fall from A Cookbook Obsession. It was like starting all over again. I’ve had highs and I’ve had lows, but who hasn’t? What always keeps me going is that I consistently receive notes and comments from you–my readers–that you’ve really enjoyed something or that a certain recipe is now a new family favorite. Thank you for reading, following, etc. If you’re just stopping by for the first time–WELCOME! Now, let’s be grateful for zucchini! If you have a garden with a zucchini explosion, you may be thinking….huh? To me, the summer zucchini glut is kind of fun. It’s a culinary challenge to come up with a new killer zucchini recipe. 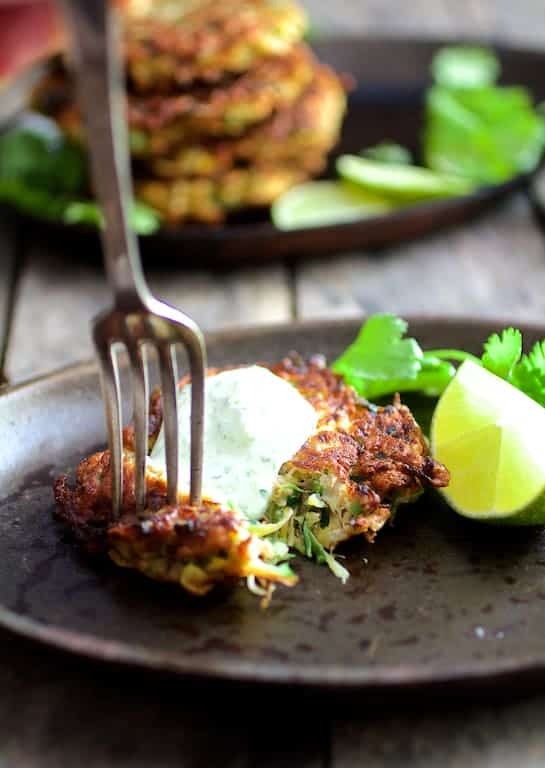 Here is a new spin on the zucchini fritter made with whole-grain flour, kicked up with some fresh jalapeno and served with a zingy cilantro-lime sour cream on the side that I think is pretty killer! Because I had not used our Oxo spiralizer in a while, I thought I’d use it rather than shred the zucchini (which is generally what you would do for zucchini fritters). Whether you spiralize or shred the zucchini is up to you; the result is going to be pretty much the same. Zucchini contains a lot of water. After spiralizing or shredding it, salt it and let it drain in a colander for at least 30 minutes. Afterward, give it a good squeeze. You’ll be amazed at how much water is released and how much it shrinks! 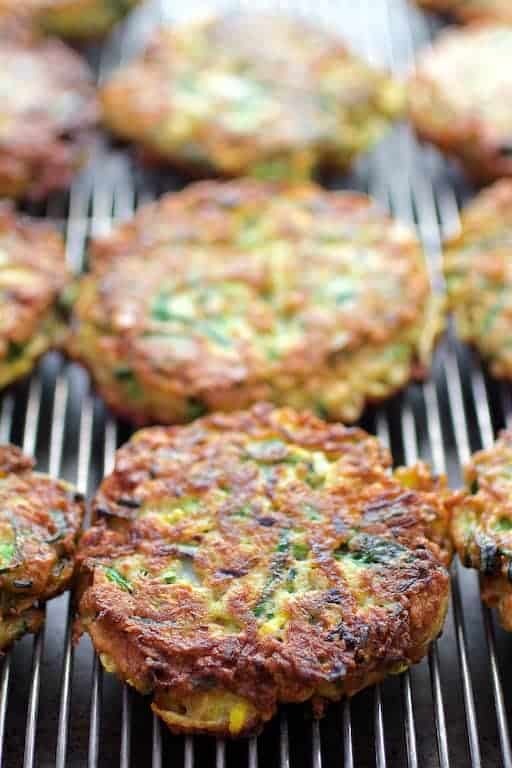 When frying these zucchini jalapeno fritters (or things such as crab/fish cakes), always flip them AWAY from you. No fun being splashed with hot oil! Drain on a wire rack–not on paper towels. Although the paper towels will absorb some of the oil, the fritters will get soggy. That’s it! Crispy, golden and…..zippy! Mmmwaahhh! 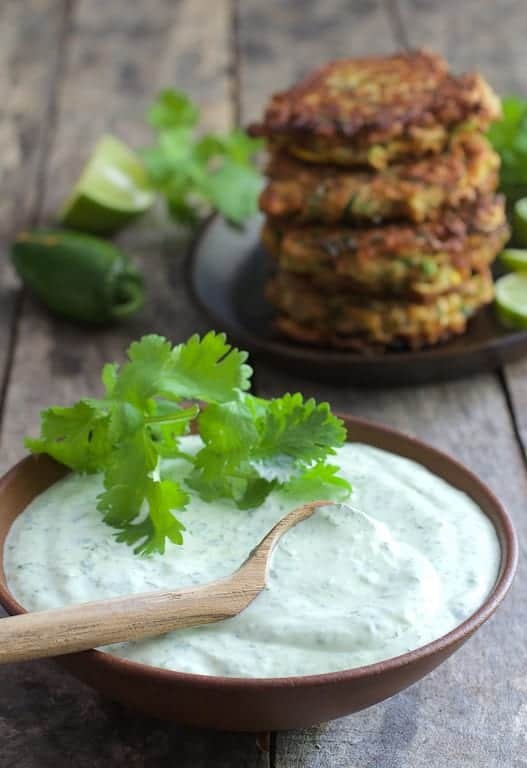 The traditional zucchini fritter reinvented with better-for-you whole-grain flour, some kick with fresh jalapeno and zippy cilantro sour cream on the side! 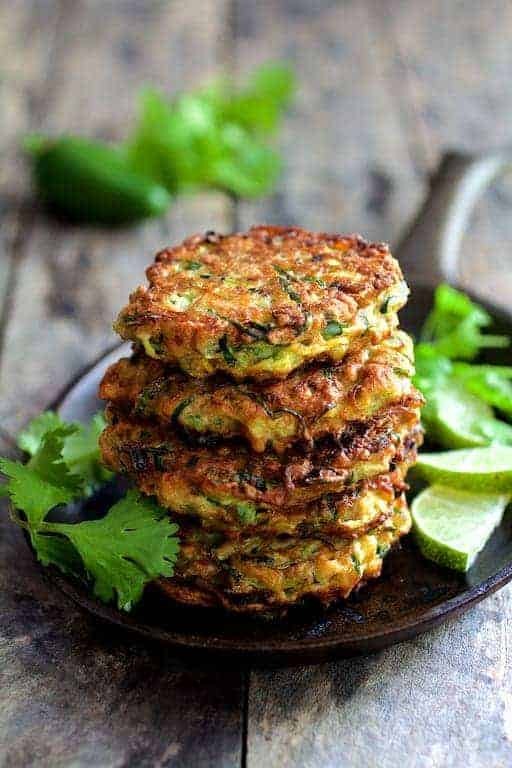 FRITTERS: Place spiralized or shredded zucchini and scallion in a colander. Toss with salt and let drain for 30 minutes to 1 hour. Squeeze excess moisture from the zucchini with your hands and transfer to a bowl. Season with black pepper as desired. Add jalapeno, garlic, eggs and flour and mix well. Heat oil in a large nonstick skillet over medium-high heat. When the oil is shimmering, place scant 1/3-cup measures of the zucchini mixture into the hot oil. Press the mixture down to form an even, flat cake. Fry 3-4 minutes on the first side, flip and fry 2-3 minutes on the other side. (Reduce heat to medium if fritters are browning too quickly.) Drain on a wire rack. Repeat until all the zucchini mixture is cooked. CILANTRO LIME SOUR CREAM: Combine all ingredients in a deep bowl or beaker. Using an immersion blender, process until smooth. Serve with fritters. FREEZER-FRIENDLY! Make as directed and freeze on a nonstick baking sheet or one lined with parchment paper. Then, place in a zipper-top freezer bag and remove fritters as needed. No need to thaw. Just place in the oven at 375 degrees for 18-20 minutes to heat through. Could someone explain how I email this recipe? There was no recipe attached to the email. I really want to do this! The http://bit.ly/21rND1W is a “short link” which is automatically generated. Not sure why it does that, but internet programs like to do that. I just tested it and sent one to myself and I got that line with the “short link” for your recipient to click on. If you want to include the whole recipe in your e-mail, you’ll have to cut and paste. Thanks again and please let me know how it worked out for you. I have never seen cilantro lime sour cream. Can one make it? These really look good and at some point would like to make them. I too would like to bake them in lieu of frying. Hi, Sunny, Yes, you’ll need to make it. The recipe for it is with the fritters. Thanks so much and hope you enjoy! can you suggest a substitute for the eggs and baking these rather than frying? Hi, Marya, Thanks for your question. Here’s some information on egg replacers: http://www.peta.org/living/food/egg-replacements/ I think the flaxseed one would work the best. I haven’t baked them but I think they’d be fine. If you’re comfortable with cooking spray and nonstick aluminum foil, I would use that to achieve a fried result. Line a baking sheet with nonstick aluminum foil, spray it with cooking spray then portion out your fritters on the aluminum foil and bake. I think 375 degrees would be good. Check them after 12-15 minutes, then flip and continue baking another 5-10. I’ve baked quinoa cakes successfully like this. Thanks so much for your question and hope you enjoy! Thanks for the egg replacement question and reply. I am vegan and I will also have to make the substitution. These sound really good! Nice tip to get a fried result in the oven…thanks, Carol! I might just try this recipe using Almond Flour. I am a diabetic and the carbs listed would be all I would be allowed to eat for a meal. A bit too high for a side dish for me. I have a question…about how many fritters did you use for a serving? Hi, Carrol! Two fritters is a good serving. Thanks so much and let me know how almond flour works. You may try baking them–just concerned that a nut flour could burn easily. I haven’t baked them but I think they’d be fine. If you’re comfortable with cooking spray and nonstick aluminum foil, I would use that to achieve a fried result. Line a baking sheet with nonstick aluminum foil, spray it with cooking spray then portion out your fritters on the aluminum foil and bake. I think 375 degrees would be good. Check them after 12-15 minutes, then flip and continue baking another 5-10. I’ve baked quinoa cakes successfully like this. Thanks so much for your question and hope you enjoy! Have you tried using a gluten-free or nut flower? Thx! Hi, Patrick, I have not. I would probably try a gluten-free all-purpose before a nut flour. I would think the nut flour would burn. If you try it, would you please report back and let me know how it worked? Thanks for your question! This is what I need to do with my zucchini and jalapeños! These look amazing!!! I feel like I start to run out of creative zucchini ideas by the end of summer. Haha, Emily! I know what you mean! Zucchini in the summertime demands creativity big time! 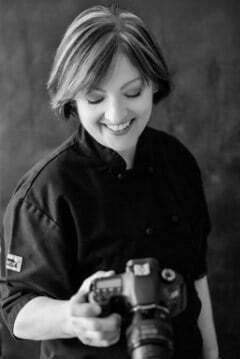 I absolutely love your work from your recipes to your photography! So glad I found your blog because I love sharing your work on Pinterest! Thalia, Thank you so much for your kind words and your generosity! Besides your blog being beautiful, you are beautiful and gracious. Congratulations on being a finalist in the Saveur 2016 Blog Awards! Great recipe Carol. I know how you feel about there are days and then there are days!! I’ve signed up for you emails and for some reason, I’m not getting your posts. I see them on Yummly but I’m not getting them in my mailbox. Do you by any chance use Feedburner? This has happened to me before and I will sign up, it says I’m already signed on and then never get the updates. I’ve checked my Junk file and it’s not there. Hang in there and gratitude is contagious. I’m thankful for wonderful bloggers who are almost long distance friends. Sending sunshine!! Ugh. Hate internet bugs. Don’t know why that would be happening. I generally do a weekly recipe recap via MailChimp but may switch to an RSS feed. Thanks for letting me know! Feel the same way about you! Hi there, is there another type of flour I could use to make this like almond maybe? Thank you. Hi, Sheila, Thanks for your question. I have not tried an alternate flour. I would probably try a gluten-free all-purpose before a nut flour. I would think the nut flour would burn. You’d probably want to bake it instead of fry. If you try it, would you please report back and let me know how it worked? Thanks for your question! These are absolutely perfect! I am in love with the fritters and then you take it over the top with cilantro lime sour cream! Genius!! And we have all had those weeks!